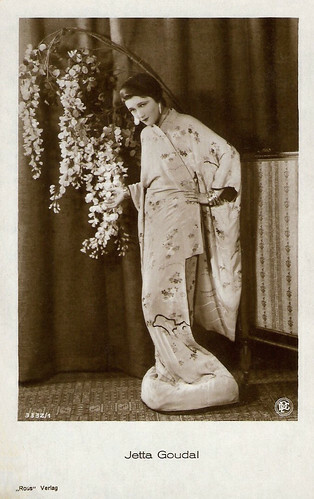 French postcard by Cinémagazine-Édition, Paris, no. 511. French postcard, no. 37. Photo: Erka-Prodisco. Erka-Prodisco Films was a French film distribution company. Her name is erroneously written as Jetta Gondal. Jetta Goudal was born Julie Henriette Goudeket in 1891. She was the daughter of Mozes Goudeket, a wealthy, orthodox Jewish diamond cutter in the Jordaan neighborhood of Amsterdam, and Geertruida Warradijn. Decades later, during World War II, her father and his second wife would be murdered in the concentration camp of Sobibor. Tall and regal in appearance, Julie began her acting career on stage, traveling across Europe with various theater companies. In 1917 or 1918 (the sources differ about the date), Julie Goudeket left a Europe, ravaged by World War I to settle in New York City. 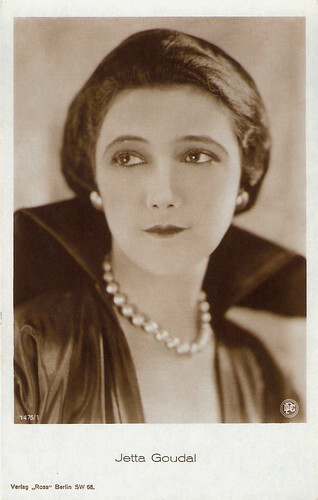 There she hid her Dutch and Jewish ancestry; she generally described herself as a ‘Parisienne’ and on an information sheet for the Paramount Public Department she later wrote that she was born at Versailles in 1901 as the daughter of Maurice Guillaume Goudal, a lawyer. Her publicist at one point even claimed that she was the daughter of legendary Dutch spy Mata Hari, but no one took that statement seriously, though. 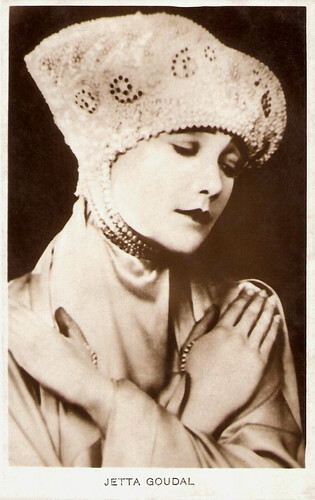 Goudal first appeared on Broadway in the drama The Hero by Gilbert Emery in 1921, using the stage name Jetta (pronounced with a French J) Goudal. 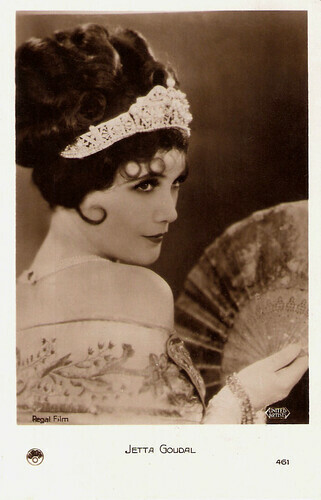 Later that year she returned with the melodrama The Elton Charm. 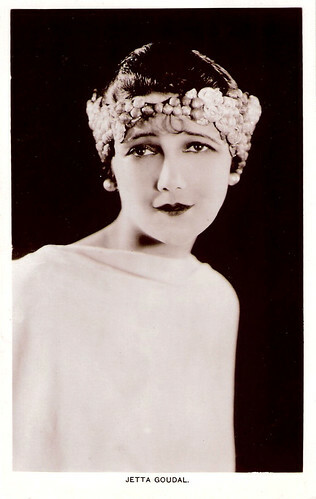 She met film director Sidney Olcott in a box at Carnegie Hall, who encouraged her to venture into film acting. She accepted a bit part in his film Timothy's Quest (Sidney Olcott, 1922) as a tubercular mother with children, in a pathetic scene with a drunken husband. Convinced to move to the West Coast, Goudal appeared in two more Olcott films in the ensuing three years. 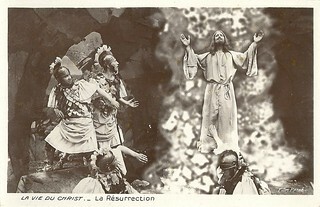 French postcard by Europe, no. 461. Photo: Regal Film / United Artists. 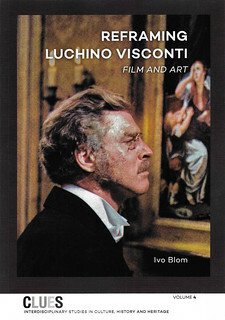 Austrian postcard by Iris-Verlag, no. 5187. Photo: Paramount. British postcard in the Picturegoer Series, London, no. 273. 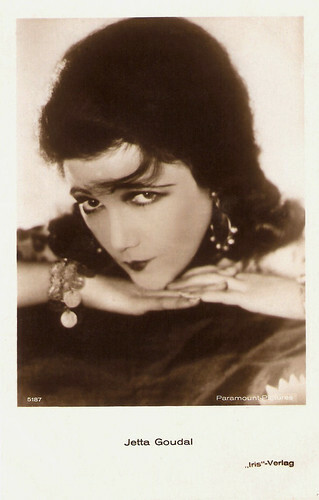 Jetta Goudal's real film debut came in The Bright Shawl (John S. Robertson, 1923) with Richard Barthelmess. 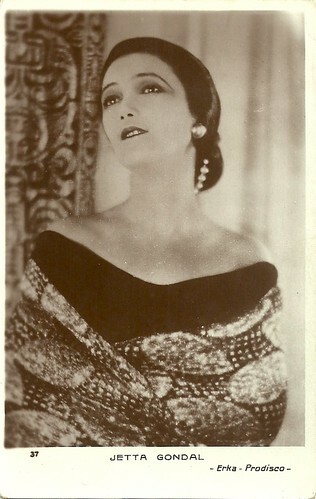 Jetta created quite a stir with her striking, exotic appearance in a secondary role as a Chinese/Peruvian spy. Critics found her "different" and "distinctive." 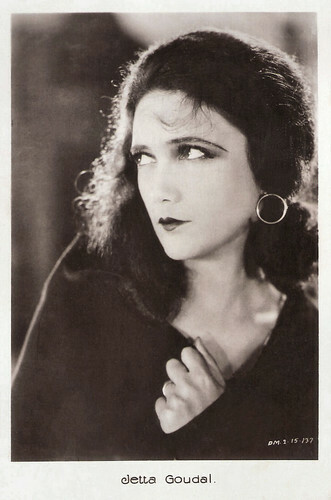 She quickly earned more praise for her following film work, especially for her performance in Salome of the Tenements (Sidney Olcott, 1925), a film based on the Anzia Yezierska novel about life in New York's Jewish Lower East Side. 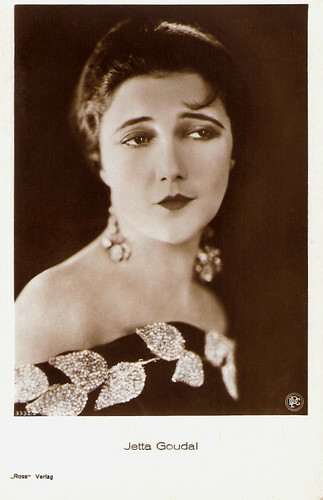 Goudal then worked in the Adolph Zukor and Jesse L. Lasky co-production of The Spaniard (Raoul Walsh, 1925) opposite Ricardo Cortez – ‘the new Sheik’- in his first starring role. Her growing fame brought her to the attention of producer/director Cecil B. DeMille. He hired her for what turned out to be some of her (and his) greatest critical successes, including her emotional roles in the highly romantic melodrama The Coming of Amos (Paul Sloane, 1925) starring Rod LaRocque, The Road to Yesterday (Cecil B. DeMille, 1925), the excellent mystery melodrama Three Faces East (Rupert Julian, 1926), the extremely powerful drama White Gold (William K. Howard, 1927) and the lush desert romantic melodrama The Forbidden Woman (Paul L. Stein, 1927) with Victor Varconi. Unfortunately, the exotic allure and element of mystery that made Goudal so popular on-screen came with a price. She was an unrepentant theatrical ‘grand dame’ and possessed a fierce temper well known to the film community. DeMille later claimed that Goudal was so difficult to work with that he eventually fired her and cancelled their contract. Goudal filed a lawsuit for breach of contract against him and DeMille Pictures Corporation. Although DeMille claimed her conduct had caused numerous and costly production delays, in a landmark ruling, Goudal won the suit when DeMille was unwilling to provide his studio's financial records to support his claim of financial losses. British postcard by Real Photograph. German postcard by Ross Verlag, no. 3332/1, 1928-1929. Photo: DPC. German postcard by Ross Verlag, no. 1475/1, 1927-1928. Photo: DPC. Vamp or Joan of Arc? 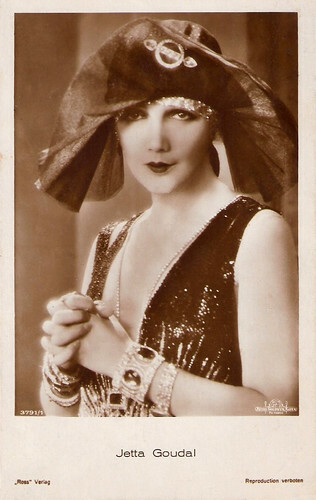 Jetta Goudal appeared as a vamp opposite Marion Davies and Nils Asther in The Cardboard Lover (Robert Z. Leonard, 1928), produced by William Randolph Hearst and Marion Davies. 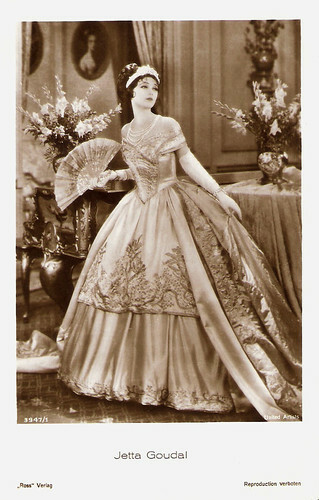 In 1929, she starred with Lupe Velez and cowboy star William Boyd in Lady of the Pavements (D.W. Griffith, 1929), a romantic drama set in the time of Napoleon in Paris. At IMDb, reviewer Drednm loves it: "While William Boyd hasn't much to do here as the Count, the two leading ladies tear the place apart. Fiery Lupe Velez is superb as Nanon, taking full advantage of the comic scenes but then turning in a terrific dramatic performance in the finale. Jetta Goudal is gorgeous and lethal as Diane, using her haughty beauty to good effect." The next year Jacques Feyder directed Goudal in her only French language film, Le Spectre vert/The Green Spectre (Jacques Feyder, 1930), a made-in-Hollywood, alternate language version of The Unholy Night (1929). Because of her audaciousness in suing DeMille and her high-profile activism in the Actors Equity's fight for the unionisation of film actors she became known as the Joan of Arc of Equity. However, some of the Hollywood studios refused to employ her and with the arrival of sound her very thick accent left her with limited offers. 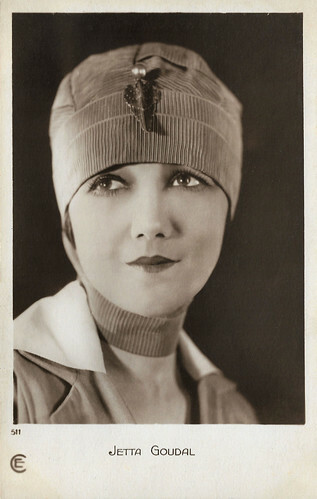 At age forty-one, she made her last screen appearance in a talkie, the comedy Business and Pleasure (David Butler, 1932), co-starring with Will Rogers. In 1930, she had married Harold Grieve, an art director and founding member of the Academy of Motion Picture Arts and Sciences. Along with her husband, she went into interior design and faded from the Hollywood scene. They had no children. Plagued by health problems (heart condition) in the 1960s, she suffered a serious fall in 1973 which left her virtually an invalid. She told an interviewer in 1985: "I don't like being called a silent star. Who was silent? I was never silent!" Shortly after, Jetta Goudal died in 1985 in Los Angeles, at age 94. 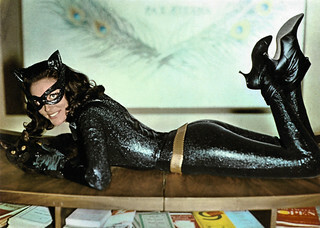 For her contribution to the film industry, she has a star on the Hollywood Walk of Fame. German postcard by Ross Verlag, no. 3332/2, 1928-1929. Photo: LPG. German postcard by Ross Verlag, no. 3947/1, 1928-1929. Photo: United Artists. German postcard by Ross Verlag, no. 3791/1, 1928-1929. Photo: MGM (Metro Goldwyn Mayer). Sources: Charles C. Benham (Classic Images), Hans J. Wollstein (AllMovie), Operator_99 (Allure), Gary Brumburgh (IMDb), Wikipedia, and IMDb. How very interesting. She died in 1985--not so very long ago. Thank you for sharing her life with the rest of us. These wonderful folks should not be forgotten.